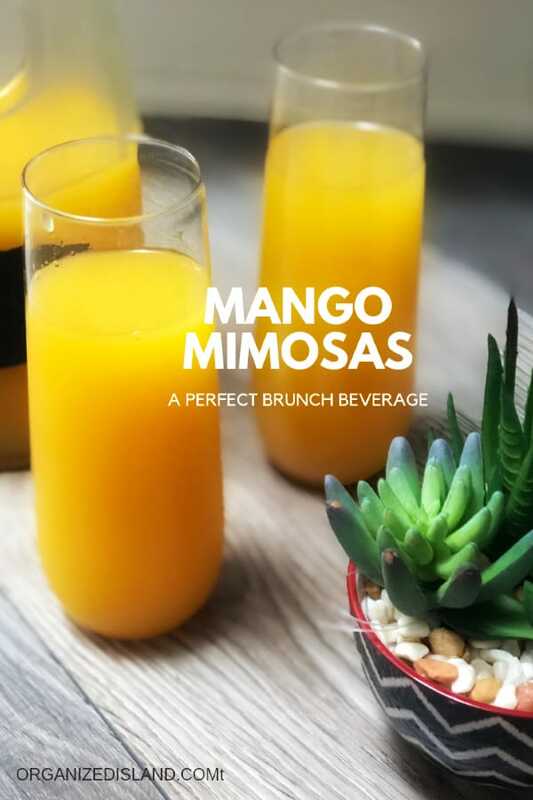 These delicious mango mimosas are just what you need for springtime soirees. We are enjoying all the flowers blooming from the recent rains and it really makes springtime so beautiful. This is the time of year I love to enjoy fresh flowers and watch the longer sunsets. This post contains affiliate links. I did not inherit my mother’s green thumb, but I do enjoy fresh flowers. I will pick them up from the grocery store on occasion and they really are a reminder of nature’s beauty. Hello Friends! We have been enjoying our recently updated yard when the weather allows. We have had a few sunny days with some cloudy and cold days in-between. Luckily, when I hosted my tea the other day, the weather cooperated. 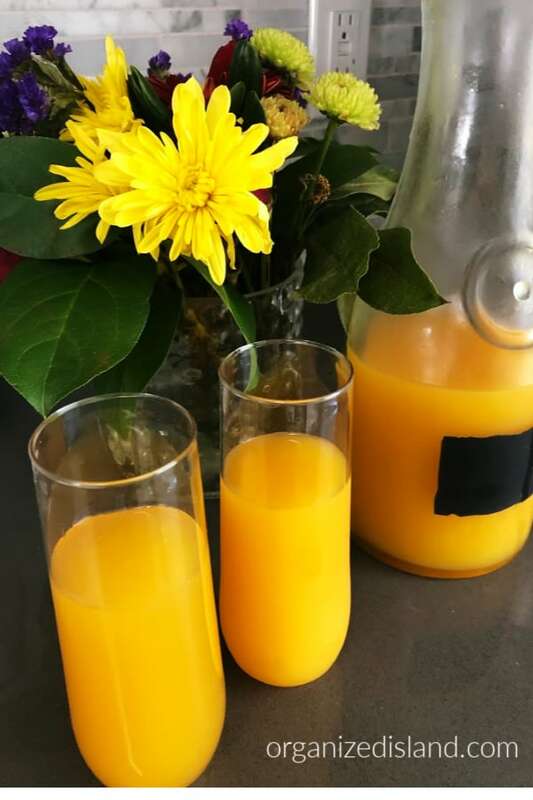 While we brewed some fabulous teas, we also enjoyed some homemade mimosas. 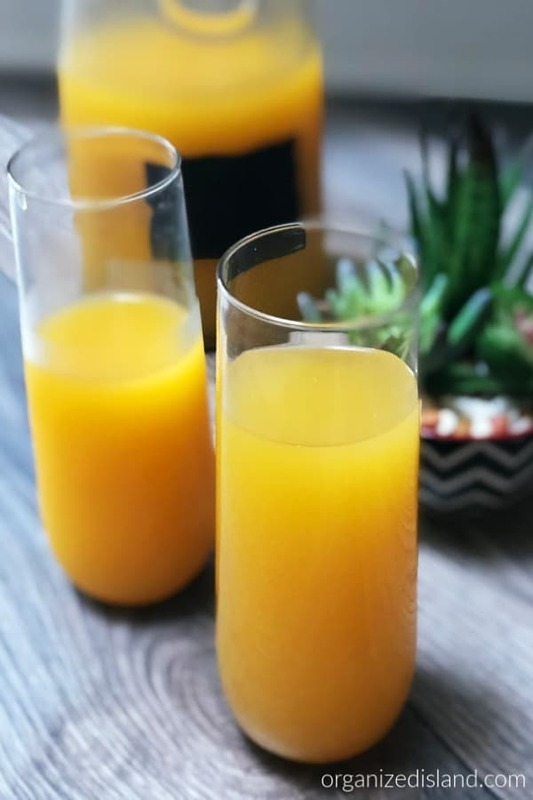 Fruit Mimosas are absolutely one of the best beverages for a breakfast or brunch outdoors. 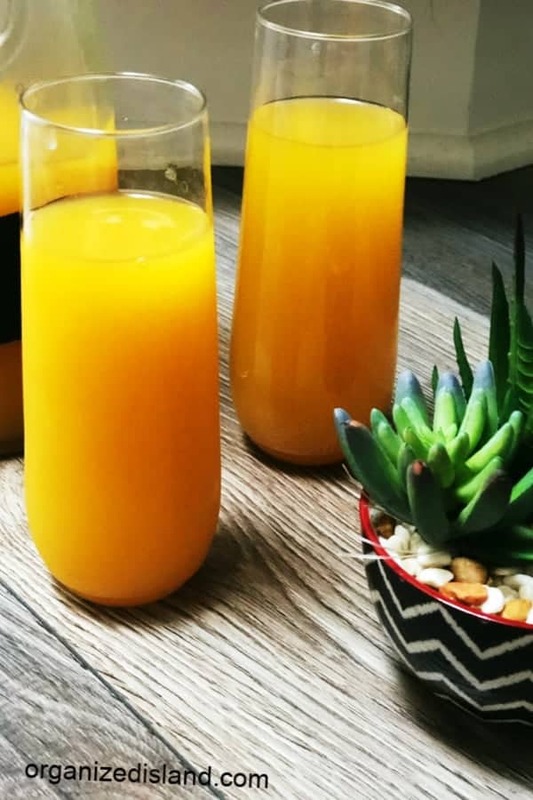 While the original mimosas with orange juice are always good, I love to change things up and made Mango Mimosas. These lovely drinks can be made by the pitcher too! I love using these stemless glasses for the mimosas. Chili Rellenos Casserole – A delicious casserole that is easy to make with hints of green chili. Breakfast Tacos – Breakfast tacos with bacon and sausage. Combine champagne and mango juice equally in glasses or in a pitcher. These are best made the morning that they intend to be served. I suggest making a pitcher of these a couple of hours before the breakfast or brunch. Don’t skimp on the champagne you use. Instead of using the cheapest of the bunch (less than $5, go up a step and find nice champagne for about &10-$14 per bottle or more if it fits your budget. Use the freshest mango juice you can find. These are not canned but in the refrigerated juice section of your grocery store. We hope you enjoyed this simple recipe idea. We are always looking for ways to inspire you and make the most of your time. If you try this recipe or any other recipe on Organized Island, please don’t forget to rate the recipe so that others can find us and let me know where you found us in the comments below, I love hearing from you! Ohh.. that is just the freshest thing ever. I can almost taste it through the screen! Cheers to spring brunches. It is so tasty and refreshing! Cheers back at you Tamara!